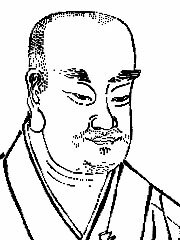 Zhiyi (智顗 Wade-Giles: Chih-i; Jp: Chigi) (538–597) is traditionally listed as the fourth patriarch, but actually is the founder of the Tiantai sect of Buddhism in China. Zhiyi is famous for being the first in the history of Chinese Buddhism to elaborate a complete, critical and systematic classification of the Buddhist teachings, in order to explain the seemingly contradictory doctrines of Buddhism. He is also regarded as the first major figure to make a significant break from the Indian tradition, to form an indigenous Chinese system. Born with the surname Chen (陳) in Huarong, Jing Prefecture (荊州華容), Zhiyi left home to become a monk at eighteen. At 23, he received his most important influences from his first teacher, Nanyue Huisi (慧思) (515-677), a meditation master who would later be listed as Zhiyi’s predecessor in the Tiantai lineage. After a period of study with Huisi, he spend some time working in the southern capital of Jinling (金陵), after which he retired to Tiantai mountain for intensive study and practice with a group of disciples, adapting the Indian meditation practice of zhiguan into his system. Among his many important works are the Mohe Zhiguan and the Liu Miaofamen. Of the works attributed to him (although many may have been written by his disciples), about thirty are extant.